Our comprehensive range of dry film lubricants provide friction control and surface release solutions for applications where liquid lubricants are impractical or could fail due to load or temperature. Reducing wear, galling, and heat generation on your components will reduce running and maintenance costs, machine downtime and operational limitations. Our dry film lubricant service is delivered by an experienced, skilled workforce and supported by a comprehensive quality process that is able, depending on the individual specification, to carry out cure tests such as the MEK rub test, adhesion tests (such as ASTM D3359), or thickness tests to SSPC-PA2. Discover our exceptional Dy Film Lubricant delivery reliability, turnarounds and quality. Contact us now to discuss your Dry Film Lubricant requirements. Our curing ovens handle large components and reach the temperatures required to achieve a high quality cure. They are equipped with internal temperature probes and chart recorders which allow us to keep detailed records of the temperatures reached and the times they were reached for. These can be included in the Certificate of Conformity, giving you or your customers written evidence that the dry film lubricant will be fully functional when it is deployed in the field. What are Molybdenum Disulphide Coatings and where can I use them? Coatings based upon molybdenum disulphide, and in combination with graphite, are sub micron sized particles of material dispersed through a blend of resins. This ensures good adhesion to the substrate. Moly coatings are a combination of molybdenum disulphide lubricant and high performance resins. Moly coatings are thermally cured and thoroughly bonded to the base metal of the coated part. 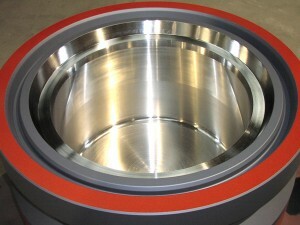 Molybdenum disulphide based coatings are used for friction reduction and control. Moly coatings have traditionally been applied on components subjected to high-pressures, whilst graphite coatings have been used in applications at high temperatures. Pretreatment of the substrate, such as blasting to SA2.5, can have a marked effect on the end anti-friction quality of the component. Dry-film lubricants like moly coatings are extremely useful for working parts which operate in an environment unsuitable for wet lubricants, or are positioned in awkward places that make wet lubrication very difficult. Different Molybdenum Disulphide coatings have variable degrees of corrosion and wear resistance qualities. The coating is suitable for heavily loaded mechanical applications, but not safe for food contact applications.